We’re the world’s leading experts in structural waterproofing solutions with over 100 years experience. Our unrivalled range of products can be tailor-made to tackle any challenge, helping you take control of water, whether you want to keep it in or out. From iconic buildings like Oxford’s Ashmolean Museum and the Library of Birmingham, to tunnels, stadiums, reservoirs and everywhere in between, we’ve supported projects big and small and we can help you do the same. The maintenance free, pre-mixed waterproofing system that’s guaranteed when the product is installed by a registered contractor. Our new pre-mixed formula saves time and makes quality control easier. It also improves the performance and application of Sika®-1. With quality comes confidence, that’s why we offer a guarantee. 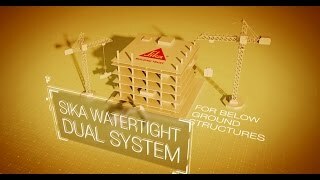 Whether keeping water out or keeping it in, put water in its place with our Sika® Watertight Concrete System and achieve truly watertight concrete structures. Putting water in it's place with our unique SikaProof® solutions – innovative sheet membrane waterproofing that'll take anything you throw at it. The Multiple System Approach to Structural Waterproofing. Get professional, unbiased advice on the right solution for your project. Our unrivalled range of products and systems can be tailored to any brief.